As of April 2017, McCormick has discontinued this product. There is no alternative item available. 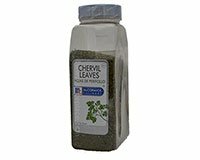 McCormick has discontinued making the Chervil Leaves. McCormick Chervil Leaves are a mild flavored herb that is part of the parsley family. Chervil was introduced to England and France by the Romans. Chervil's flavor is subtle with slightly sweet flavor and Chervil often used with other herbs to enhance their flavors. Chervil's flavor is similar to anise and parsley and its aroma is reminiscent of tarragon. While Chervil is a member of the parsley family, Chervil is much more aromatic than parsley. The Chervil plant itself is a small, low-growing annual and its leaves are bright green. A hardy plant that grows wild in damp, shady spots, Chervil is one of the first herbs to sprout in the spring. Chervil is often used as an alternative to parsley. Use Chervil in salads, sauces, omelets and stuffings . Chervil adds aroma to numerous dishes from appetizers through the salad course. Since Chervil tends to lose its flavor when cooked and is best to add Chervil to recipes just before serving. Chervil is well suited for use on white fish, eggs, sauces, soups,cream cheeses and along with spring vegetables.